When CBC began experimenting with the internet in the early 1990s, one aspect excited and terrified journalists and technicians alike: the internet promised to be a two-way street. Gone would be the days of CBC only sending information via TV or radio. In this brave new world, our audience would interact with us, and with each other. In many ways, the jury is still out. Certainly the internet has allowed Canadians unprecedented access to the corporation's inner workings. With a few keystrokes, they can react to a news story, pose questions to on-air guests, pitch a show idea, vote for the Greatest Canadian, report a typo or sound off to the ombudsman. Some of the more cutting edge CBC.ca experiments have even allowed users to submit their own show content, and form communities based on common interests. But the two-way street has been rocky, and characterized by a lot of trial and a lot of error. As you’ll see below, CBC.ca has tried some interesting experiments over the past 10 years. Some have been more successful than others. Some are ongoing. But in almost every case, CBC got more than it bargained for. Forums (or message boards) allow users to post comments in "discussion threads." Over the past decade, CBC.ca has tried several kinds, with decidedly mixed results. 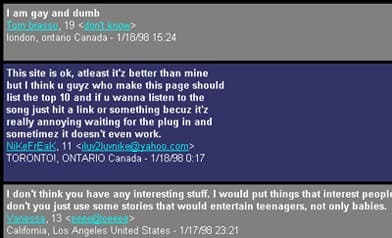 Beginning around 1997, many CBC sites and shows created their own forums, promoting story-based discussions much like those found on today's blogs. Starting around 2001, CBC.ca also established general discussion boards based on suggested topics. Some generated wide interest – hockey, the war in Iraq, fires in British Columbia, the Salé and Pelletier Olympic skating voting scandal. But others became dominated by a small group of regular contributors. Those users, at least as they presented themselves, were a motley crew: “Sundog,” the agent provocateur; “Ook,” the sensitive librarian; “TaraDragon,” the abuse survivor; “Red,” the den mother; “Roch,” the ladies' man. There was a proponent of the Aryan Nation, and another man the moderators feared was suicidal. According to CBC.ca moderators Lee Ferguson and Josephine Buiza, members formed a virtual community, trading links and information before it hit the news. "There was real meat there, real content," says Ferguson. But keeping things under control was an exhausting drain on limited resources. "It was essentially a small group of people using a public broadcaster's facilities to have a discussion among themselves," says CBC.ca manager John McQuaker. A few hot button issues – abortion, the Middle East – attracted a wider audience, and proved to be uncontrollable. On those subjects, "there was no middle ground where people were willing to listen to the other side," McQuaker says. "The opposing side is not seen as legitimate." The ensuing flame wars were exacerbated by a fundamental problem in the way the forums operated. Comments were "post-moderated" – moderators looked at them after they went online, not before. If anything was defamatory or offensive, moderators wouldn't know it unless they received a complaint, or stumbled across it on their own. Technological solutions made things even worse. Keyword filters were introduced to restrict offensive or inflammatory posts. The filters blocked a predefined set of words, but that only led to creative spelling – and howls of censorship. The writing was on the wall. Unable to hire enough moderators to tightly police every conversation, CBC.ca decided to shut down the forums later that year. "The concept is wonderful, and the goal is terrific", says John McQuaker. "But instead of having the Oxford Debating Society, we got a rowdy downtown pub with everybody shouting and nobody listening." Despite these problems, discussion boards for CBC programs sometimes proved invaluable, occasionally advancing news stories in surprising ways. 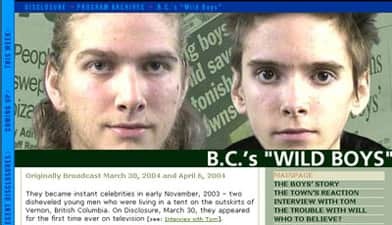 In the spring of 2004, CBC News: Disclosure aired a story about two mysterious, dishevelled young men who were living in a tent on the outskirts of Vernon, B.C. The pair claimed they had been raised in virtual isolation in the B.C. interior near Revelstoke. Disclosure's story made international headlines. It also led to a tip that changed everything. A family member posted a message on Disclosure's discussion board that revealed the truth: “Tom” and “Will” weren’t “wild boys” at all – they had actually grown up in a suburban home outside Sacramento, Cal.. They had been on the lam for six months. That post on Disclosure's discussion board prompted the program to produce an incredible follow-up to the original story: Disclosure's cameras were rolling as the truth about Will and Tom emerged; as the oldest brother was taken into custody; and as the parents were reunited with their sons. If CBC sites wanted a quick hit of user feedback instead of (or as well as) a full-on discussion, a guest book was the way to go. No registration, no delays – just instant opinion. Like the CBC.ca forums, guest book comments would appear immediately and were moderated after the fact, if at all. Site staff would arrive each morning and check the new guest book entries with considerable trepidation. While some of it was thoughtful commentary, some wasn't. The first entries in the CBC4Kids guest book on the morning of Jan. 18, 1998 give some clue as to why they were discontinued. CBC programs began receiving their own show e-mail addresses around 1996. It seemed obvious that if you wanted user feedback, you needed to provide your e-mail address on your website. If a webmaster or journalist wanted feedback, he or she would often post his or her personal address on the site. That might have worked in 1996, when only a quarter of Canadian households were wired and CBC Audience Relations received 50 e-mails a day. Fast forward to 2006, when two thirds of all Canadians use the internet and 91 per cent of them use e-mail. Worldwide, 30 billion e-mail messages are sent each day – and 10 billion of those messages are spam. Today, CBC Audience Relations gets over 800 e-mail comments each week. (Thankfully, they are usually submitted through an online form, which is efficient and thwarts spam.) Those former "webmasters" who are still using the same addresses they posted on the web years ago are paying the price in the form of 50 or more spam messages daily. I would like to know the reason for hockey players to do so much spitting, when sitting down on the bench, I did not see that spitting coming from our Women hockey team. The correct answer is (of course :P) the FOREST MOON of Endor. Hi, I was just wondering if Casey was Mr. Dressup's son. If this is not true can you tell me who he was to him. Despite all the challenges, the internet is still a two-way street, and CBC will continue to explore all its possibilities. Some of the most positive experiments have been the simplest ones. CBC.ca news stories now have accompanying links that let users report typos or send feedback. The most insightful user comments are posted online in a format known internally as "modified letters". "We'll definitely see more broadcasts with interactive components," says CBC.ca business manager Bob Kerr. "There's a multiplatform strategy baked into the mandates of all the media lines." So, stay tuned. The next 10 years of CBC.ca might be created by — you. Paul Gorbould is one of CBC.ca's first full-time employees. He came to CBC in 1995 after receiving a masters degree in journalism from the University of Western Ontario. In 1997 he produced the CBC4Kids website and created sites for CBC Radio programs. Since 2002 he has worked on the award-winning CBC Digital Archives website.